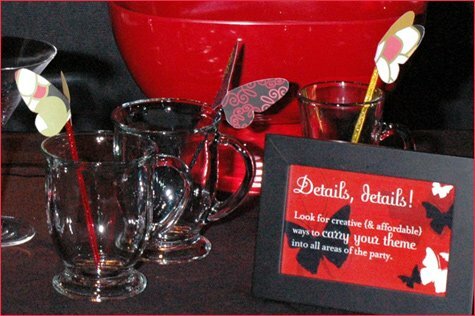 The cool “circular thing” (for lack of a better term) pictured above is actually a picture frame – but it easily becomes party decor when filled with the same decorative scrapbook papers used elsewhere in the party. 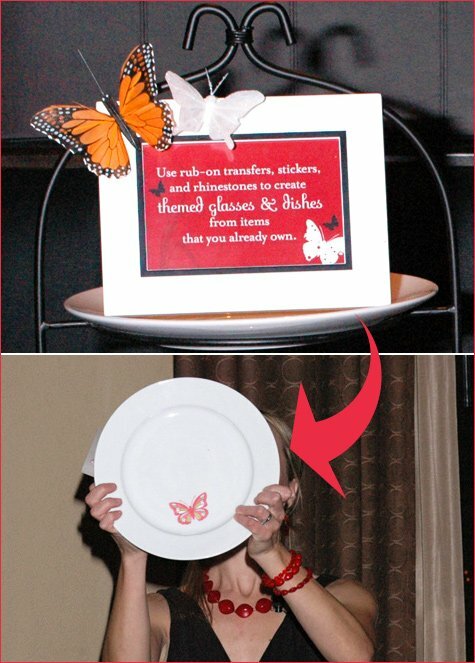 You could also personalize something like this for the guest(s) of honor by mixing in a few photos of the birthday girl or happy couple in some of the circles. 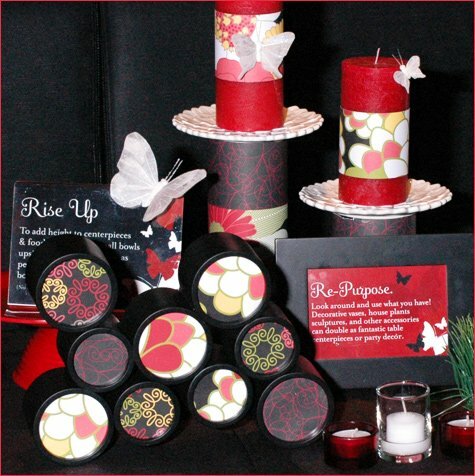 The “pedestal candle holders” are actually simple glass cylinder vases ($1.50 – $3 ea) wrapped in scrapbook paper with candle-safe plates set on top of them. The plates are secured firmly to the vases with glue dots, which easily peeled off after the party was over. Pictured above: more home accessories dressed up with paper, butterflies, & inexpensive vase fillers & grasses purchased at Michaels. Pick a theme. 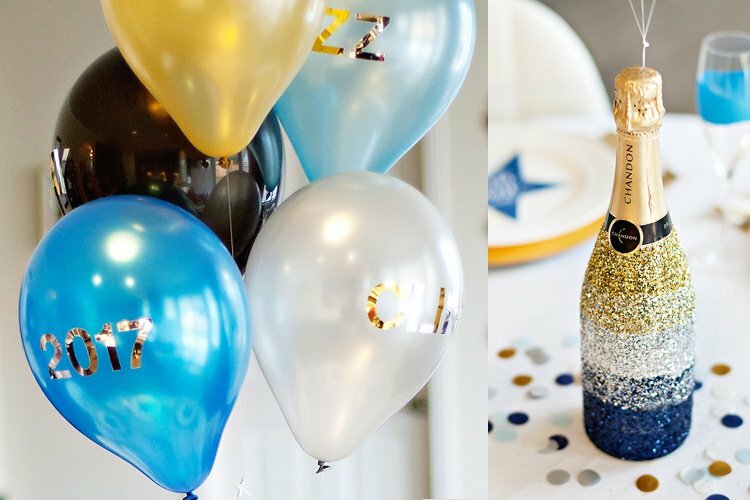 Whether your theme is specific or as simple as a certain color, having a party theme in mind will make the planning process much easier (and keep you from buying things you don’t need). Go modern minimalist. 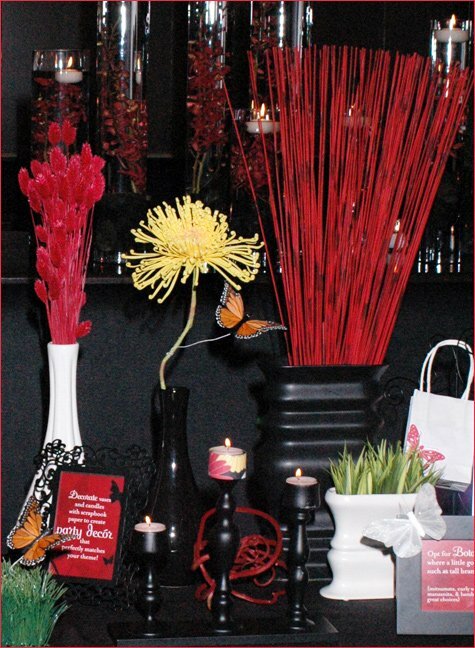 Instead of very large, expensive floral arrangements, try displaying just a few individual stems in bud vases or simple glass cylinders. Serve a variety of finger foods instead of a fancy full-course meal. Keep the recipes tasty, yet simple and focus on creative presentation. 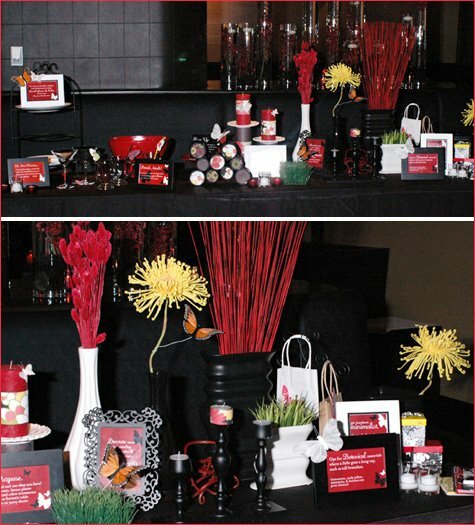 Decorate vases and candles with scrapbook paper to create party decor that perfectly matches your theme. Cheers! Dress up cocktail glasses with fun details like rhinestones, ribbon, metallic pipe cleaners, & festive DIY drink charms. Hope you’re able to find some of these tips useful at your own future get-togethers! That’s it for the Boston recaps… I’m off now to continue working on the details for next Thursday’s “Old Hollywood Glam” event! So cute Jenn! Where did you get the glittery butterflies? And did you have any sort of stencil for the ones you cut out to go on the drinks? Joanna gave me the idea of using butterflies on fishing wire to dress up my window baubles this spring (i know, way ahead of myself) and I wanted to know where I could find them! Also, where do you find the twigs and branches. I’m guessing you just spray paint them? 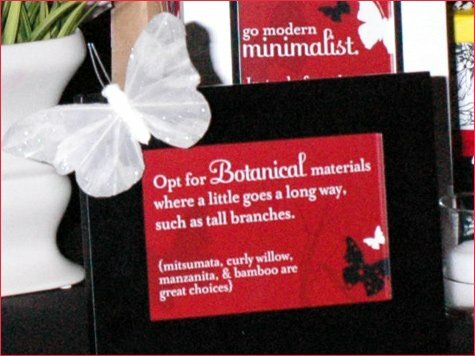 I got the butterflies at a local design/craft store in San Diego, but I’m sure you could find them online too. This website has the exact same ones – but it looks like they also have order minimums of around 3 pieces. 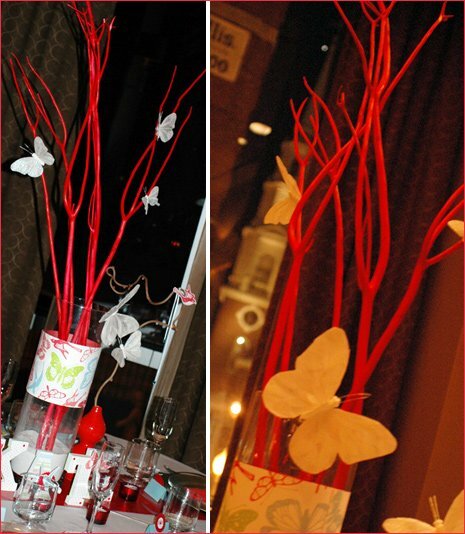 I used just one of these white butterfly garlands (which actually already are on fishing wire, so I cut the garland up to use them individually) – and one box of small 3″ butterflies for the entire room – so a little goes a long way! The yellow & black monarch butterflies are from Century Novelty and they have lots more options as well! I wanted to let readers know that Micheals has a bunch of butterfly stuff out right now in the dollar sections…they had some cute glitter clip-on butterflies! So pretty! Once again, such a great job. 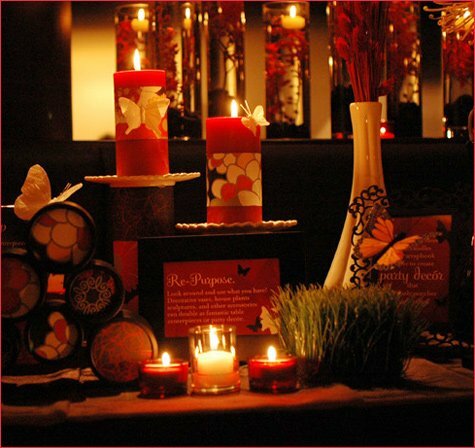 You would never know how freezing it was outside with how warm the decor made the room! I can’t stop looking at this one! I LOVE the butterflies and the colors and all the great tips! Are you going to Atlanta? Any plans of having an event in DC? It’d be great to have you here! !